Papa bunny spent the whole summer in the vegetable garden. He grew lettuce, cabbages, eggplants, radishes, and carrots. 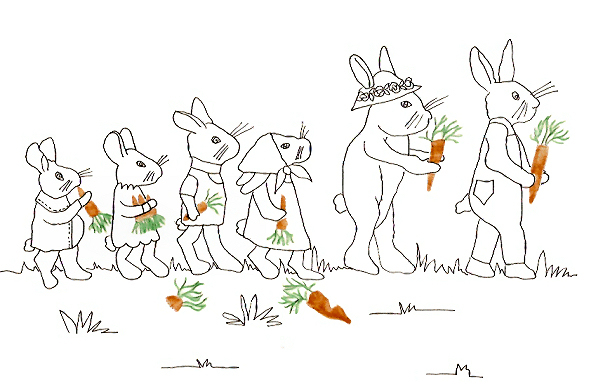 His family loved carrots. One day he went home to the burrow and Mama and their four bunnies sat around the table. “Thank you, Papa.” Angora took her cabbage and ran to her room in the burrow. She ran up and grabbed the lettuce. “Thanks, Papa. I love lettuce.” She ran to her room and ate it all by herself. “What about me, Papa? What did you bring me?” Lilac jumped off the chair. “Thanks, Papa.” She carried the big vegetable to her room. “Did you bring me a radish, Papa?” Rex stood and looked up at his Papa. “Yes,” Papa said. He pulled a radish out of the basket. “Oh goodie. My very own radish. Thanks, Papa.” Rex ran off to his room holding the radish in his arms. “I do too,” Papa said and finished his carrot.